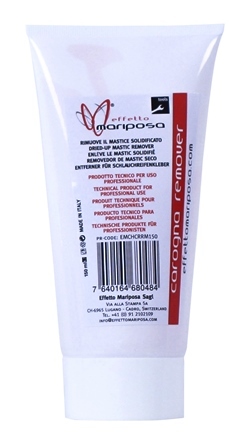 Effetto Carogna Tubular Glue Tape Remover - 150ml. Carogna Remover is a modern solvent that will soften/gelify dried-out mastic or other glues, allowing to completely remove them from carbon or aluminum rims. That will provide the optimal surface for passing to our Carogna tubular tape... or use fresh mastic on a clean rim. In fact, despite its very strong action, Carogna Remover doesn’t contain any dangerous or flammable chemical and is totally benign to metal or carbon fiber. Part #: EM031 - 150 ml tube. Q: How many wheels can be done with a 150 ml tube of Carogna Remover? A: This depends a lot on how much you put on each wheel. It’s realistically between 4 and 8 wheels. Q: Does it have an expiration date? A: The chemicals used are stable. We warranty it for two years from the date of purchase. Q: If someone leaves it in his shed and freezes during winter time will it lose it effectiveness? A: We recommend keeping Carogna Remover in a dry place, away from direct sunlight and extreme temperatures. The product should be stored at temperatures between 0°C and 40°C.